My latest series, “Abstract Narratives,” evolved over the last year during my Artist Residency in Motherhood, where I was exploring the balance between creativity and domestic life. The journey began as a joke in my head where I asked myself what are the two things I miss since having children? The first was sleep, the second was making art. I continued to ask, what would happen if I slept on paper? 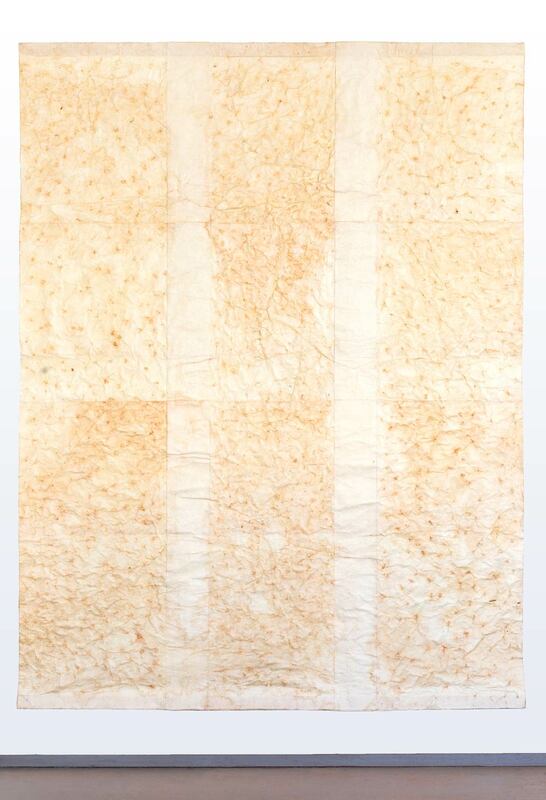 For six months, while co-sleeping, I slept on top of 9 sheets of Kozo paper, which got harvested and processed weekly. Allowing chance into the work, the paper we slept on became a map for the movement of our bodies as it became creased and torn. Bringing the paper back into my studio, I brought intention into the work by transforming it into large scale collages, which were built on a one-to-one scale of my Queen Sized bed. Responding to the surfaces of the “sheets,” I employed drawing and painting techniques. Using natural materials such as dyes made from baby puree's in my kitchen, sensorial substances such as wine, coffee and chocolate, cardboard utilized from mulching my gardening, to sand and clay found near the Rio Grande, I was able to intigrate daily life with my practice. What I unearthed was that the work was embodying the Japanese philosophy of Wabi-Sabi, which holds that everything is "imperfect, impermanent, and incomplete.” Characteristics include: rough textures, natural materials, economy of means and subtle hues. Other attributes of Wabi-Sabi are it invites the accidental or happenstance, as well as the careful and artful mending of damage. Bringing the space of the bedroom out into the world, I expanded it’s context from domesticity and interiority to exploring other aspects of my life such as the Southwest Landscape, my contemplative practice in Buddhism and meditation, play with my kids and my involvement with community organizing and activism. This extension to the work led to examining the intersectionality of my personal stories and the breaking out of the constructs of my identity.